BOA Account Bonus: If you are a have BOA checking account. You can get bonus cashback in addition to 3% 2% 1%. It even apply to sign up bonus! From Security card : BOA Security Card ( no SSN can apply ) can be product to this card. This card is good for newcomer with no/limited credit history. It covers supermarket and fuel , two main categories. 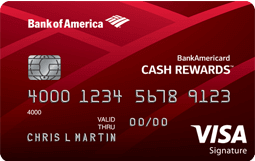 If you have a BOA premier checking account, this card becomes one of the best none annual fee card, with up to 5.25% in gas, 3.5% in grocery and wholesale store, and 1.75% for everything else. AMEX Everyday Preferred credit card is also a good choice for grocery spending, since it earns up to 4.5 Membership Rewards per dollar. In addition, using categories swap and AMEX OFFER, you can save even more. But this route is just for more experienced card player.